A truly amazing story unfolds when you are taken around the vast underground bunker at Neatishead Radar Museum where we went on 13th October. Other than the radar consoles almost everything is still there as it was in service up to the close in 2003; you almost go into a time warp. The consoles can be seen in the above ground Airspace Monitoring and Control Room in the onsite museum. This is an all important part of military history that kept us safe during the various crises of the cold war period (some of which we knew about and many we apparently didn’t), and to a lesser extent today. Ladies day this year was a trip by Eastons coach on 2nd October to Hampton Court Palace and Gardens, next to the river just outside Kingston on Thames. The Palace dates from 1529 and was originally the home of Cardinal Wolsey who, following considerable persuasion, later gave it to Henry VIII. Today the Palace continues to display works of art from the royal collection and the extensive gardens contain the celebrated maze, the historic tennis courts and the largest grape vine in the world. For our charity day at Sandringham, in aid of Pancreatic Cancer this year, we decided to open the event up as a general classic car day, which I think made it more interesting. We had 85 cars turn up and together with what Gareth took in the charity gazebo the event raised a record £1764. An additional donation from club funds, plus a further donation from the committee members, made this up to a round £2000. 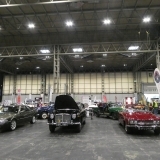 The president of the Pancreatic Cancer charity, Lynn Walker, chose the car of the show for us and presented the prizes. We made sure the event was reported in both Lynn News and the EDP which made good PR for both the club and the charity. Henham on 16th September was thankfully dry this year after the mud bath in 2017. It is always a good show, along the lines of the Weeting show, but more manageable in terms of seeing everything in a day. This is an annual event in the club diary and the usual group of members had a very enjoyable day. The Goodwood Revival event is, without a doubt,the best classic car event anywhere. This year it was held over the weekend of 6th – 9th September and 3 club members traveled down but not in our classic this time. The event is pure nostalgia with 1000+ classic cars on static display, classic racing, period entertainment, visitors in period dress – there are not enough superlatives to describe the event. Best of all you can stroll around the paddock and get within touching distance of all the cars being prepared for racing; and there is some very expensive machinery there. Everyone should go at least once, you will be enthralled. New for this year was a visit to Happisburg lighthouse on 9th September with lunch at the nearby Lighthouse inn. Despite overlapping with Goodwood, the event was well attended with several intrepid members climbing all the steps to the top of the lighthouse and enjoying the splendid views across the countryside and out to sea. Two members had an enjoyable couple of days at the Norfolk County Show with our Rovers, courtesy of the NCVC, with much interest in our cars. I had the honour of taking my namesake Bishop Graham James and his wife into and around the arena in my P4, and delivering him to the reception party at the grandstand. It turned out to be quite fun for all concerned and our club got a good plug from the person giving the commentary. Getting the car back to the club stand on the other side of the field, through the masses of visitors, was not so much fun. On 5th August 4 members made the trip down the M11 and round the M25 in our classics to the Brooklands museum in Surrey for the P6 national. This is a fascinating place with its motor racing and aviation history dating back to 1907. Much of the original banked racetrack is still in place and many of the aircraft built by Vickers, who established a factory and airfield there when racing stopped, are on display. The cars filled the members car park and Peter Cane won best other classic with his excellent SD1. 2018 marked the 50th anniversary of the Weeting Steam Engine Rally and Country Show, held over the weekend of the 20th – 23rd July. A group of members traveled over on the Sunday and had a great day. This year was a truly massive show with everything you could possibly imagine at a large country fare. Horse, steam, petrol & diesel powered including miniature & standard gauge steam railway lines and many other working demonstrations. In addition to model engineering and food there was the usual array of trade stalls. We also did our bit in keeping the Rover name alive by taking our cars around the arena. This year is the 50th anniversary of Banham Zoo park in deepest Norfolk and to mark the occasion we were invited to put on a display of 1960s cars. We arranged a static display in the afternoon and then paraded the cars around the park in the evening, to the delight of all the visitors. This was also on 14th July (see below)but it’s great that the club is now large enough to support two different events in the same day. The different format at the Mid Lincs Rover rally at East Kirkby on 14th July meant that we were able to have a club stand this year and all park together. 16 members made the long trip from Norfolk, and others from Cambridgshire, to put on an excellent display. To the delight of all the Lancaster, Just Jane, performed it’s usual fast taxi runs and we were also treated to a flypast by the BBMF Spitfire and a formation of the modern equivalents. The North Norfolk Railway Heritage Transport Day is always a favourite in the club calendar and a record 17 members enjoyed a day on the different trains and classic buses on 1st July. Fantastic weather and over 500 cars to view made for a perfect day. Several members joined with the NCVC to display their cars at the 2 days of the Royal Norfolk Show on 27th & 28th June. Again splendid weather and a great deal of interest in our Rovers. As if that was not good enough, we were asked to take the Bishop of Norwich into the main arena, in a P4, and do a couple of circuits before delivering him and his wife to the reception party at the main stand. Quite an honour! 23rd June saw a group of members at the Neatishead Radar Museum. This was a first for the club and a fascinating day. We were given talks on the role of the Radar & operational control station from WW2 right up to the end of the Cold War. Much of the control room equipment is still in place, which added to the interest. A further visit is planned when we will be allowed to explore the underground bunker – Terry has the details. The Swanton Morley and Goodrich Park rallies were both held on the same day this year, 17th June. Both were interesting events with a good range of exhibits but tractors of every imaginable style and make tended to dominate. Quite where they all come from is something of a mystery but they are clearly becoming as collectable as cars. The P6 Rover Owners Club Northern National was held on 10th June at Crich Tramway Village in Derbyshire, not far from the Peak District. A number of members made the long trip but were well rewarded by a fantastic day with the cars being allowed onto the Victorian streets of the museum. With tram rides, walks and all the period building to explore, all had a thoroughly good time. This is Carton Colville x 10. We always like to support the NCVC at their annual Strumpshaw rally which this year was on the 3rd June. We again had a club stand with 15 of our cars on display which included most models from a P2 to a modern 75, including a rare 216 Cabrolet. The weather was kind to us and we were again entertained by the father & son Guitar duo playing many of the iconic 60 numbers. The link to the report on our very successful Bressingham rally on 27th May can be found on the Home page. Skeyton Goat annual charity rally was held this year on 20th May and the 400+ cars attending completely filled the field. This is another show that has grown over recent years and is always a bit different from others in having specials, steam cars, American monsters and even one or two Italian supercars. As always a good day with good friends and excellent weather so that we could sit around the cars chatting. The Stradsett show on 6/7th May was the largest ever and with fine weather & some interesting exhibits it was a very enjoyable day. The show had been cancelled earlier in the year due to problems with the estate management and everyone thought that was the end of this annual show but sense prevailed at the last minute and the organisers did an excellent job in putting it back on. In addition o the cars there were tractors of every shape & size, traction engines, agricultural & horticultural machinery and many trade stalls. For this year’s Drive-it-Day we organised a road run through many of Norfolk’s interesting villages including the quaint Barnham Broom, the aptly named Swannington and on to Wroxham for a visit to Miniature Worlds. This is the largest model attraction in the UK with 8 model railway layouts, an extensive interactive zone including flight and train driving simulators, and a zone including model cars, boats, planes. We then moved on to Wroxham Barns, with its many craft outlets, and finally to Horning for a meal together at the Ferry Inn, overlooking the river and adjoining marina. Our stand at this year’s NEC Restoration Show was again a resounding success. Unfortunately one car broke down on the way which left us with Glen & Marie-Anne’s Hearse and Graham Teeson’s Roverfest winning P2, but we still put on a very good show with both cars attracting incredible attention. We took £88 in sales, recruited 3 new members (possible more), gained invaluable publicity and above all had a really good time. Next years show will be on 22 to 24 March inclusive.